Dhinchak Pooja was seen hailing her scooter as a 'dilon ka shooter' in her latest song. 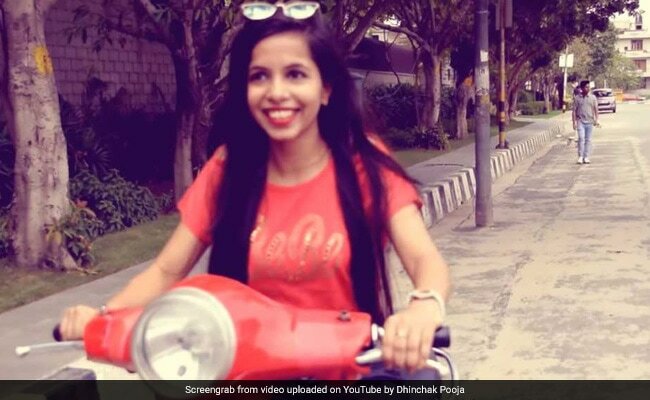 Her scooter may be a 'dilon ka shooter' but even Dhinchak Pooja can't ride it without a helmet. After a man tweeted Delhi Traffic Police about Dhinchak Pooja riding her scooter without a helmet while singing loudly, the police assured him that action would be taken against her. "Aapke sandarbh mein ye mohtarma bina helmet scooter chala rahi hain aur khoob shor kar ke gaane gaa rahi hai" (This woman is driving without a helmet and singing loudly) tweeted Mohit Singh to the Delhi Traffic Police in Hindi with a picture of Dhinchak Pooja on a bright red scooter. On Delhi Police's request, Mr Singh followed it up with the time and date of the offence. The traffic police then assured him that action would be taken against Dhinchak Pooja. Meanwhile, we'll just have to wait and watch where this goes.